NekomimisFTW.com • View topic - Heroic Neko saves child! I know that the majority of pet dogs are just fine and not aggressive, and aggressive dogs are generally the result of poor ownership. However I just have to post this video. A warning though, it is a little violent because its security camera footage that captured a dog attacking a child, and then the 'hero' cat jumps in....well, you'll see. The boy you see being dragged off his bike, by his leg, received a severe bite to his leg that required stitches. It surely could have been worse. Had the boy's family cat Tara not come to the rescue, things could have been disastrous. The dog belongs to a neighbor, it wasn't simply a stray running aruond. Most dogs don't show this kind of wanton aggression, its not clear why this dog was loose, nor why it was so aggressive. Lots of people dismiss cats as cold, aloof, independent, disloyal balls of claw and fur. Unfortunately in many places cats are simply not valued as pets, while dogs are treated as members of the family. Cat owners however know differently. Sure they are more independent than dogs, they don't have the same pack mentality of dogs, so owning a cat is not like owning a dog. However cats are amazingly loyal, loving and capable of defending themselves. As you all know, we have many cats in our home, they are either rescues or adoptions from shelters. Over the years I've seen cats do a lot of things, but I've never seen a cat actually take down a dog, and I've never seen such a clear example of a cat defending a member of it's family. Many people don't realize that cats become a part of the family, and they *will* defend their family. 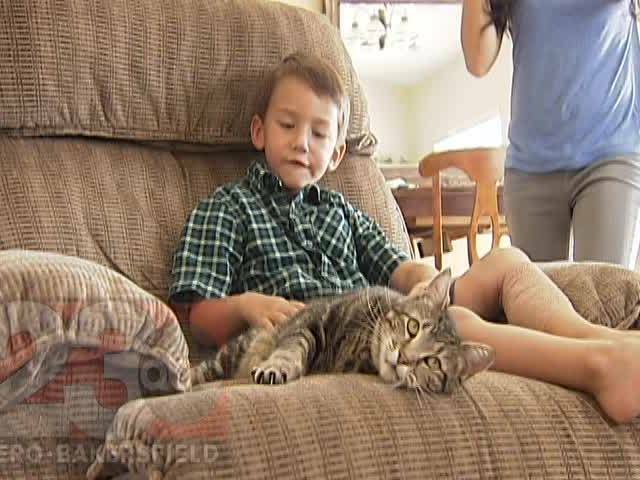 Tara - the cat that saved the young boy, is his family's pet cat. Perhaps her maternal instincts kicked in because she understands that the boy is a human 'kitten'. Or perhaps like many cats she sees her family as soft and in need of a provider/protector. Either way, Tara is to me a Neko of heroic proportions. I've decided that Tara will be honored as a Heroic Neko for displaying huge courage taking down a dog 2-3 times her own size in defense of a child. Not only did she immediately break off the attack, but she chased the dog away, defending her family. So, in honor of that and for being an example of fine Neko behavior - and because I feel like it - I hereby confer the title of Heoric Neko on Tara. Here is the hero and the young boy she saved. Re: Heroic Neko saves child! UPDATE - The dog will be euthanize. Responding police officers stated that if this had been their own son, the call response would have been for "Shots fired." that cat had alot of courage (or should i say, balls) for going up against a dog. The cat is a real hero, protecting her family. Even if it's not her kin. It's moments like this, that make people proud to be cat owners.